At the beginning of 2018, Caliber started monitoring the 20 most known companies in the FTSE-100. We have now taken the opportunity to discover the most trusted and liked companies in the UK throughout 2018, and reflect on lessons learned from the year’s biggest movers. Earlier this year, our 2018 Global Industry Ranking Review revealed that the most trusted and liked industries are typically the ones closest to consumers in their everyday lives, such as food and apparel retailers – and this is very much the case in the UK. Four out of the top 5 companies there are major retailers, such as M&S and Tesco taking 1st and 2nd place in the hearts of the British public. 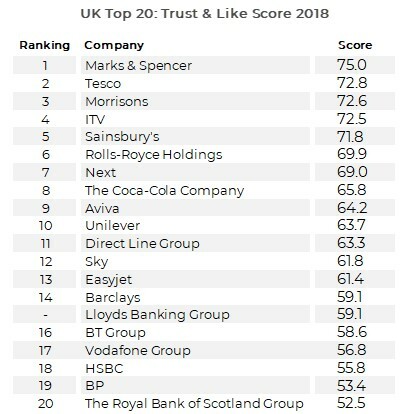 The exception being Britain’s public service broadcaster ITV, coming in as the 4th most trusted and liked company in the UK, almost 10 points above the industry average. It appears the free-to-air ITV has yet again earned the title as the UK’s most loved commercial broadcaster. However, just belonging to a well-perceived industry doesn’t mean it’s all smooth sailing, as Toys”R”Us and New Look recently learned. With the ever-looming Brexit deadline, political tensions and weakening growth in consumer income, uncertainty in the UK has certainly had some influence on market sentiment. With uncertainty mounting, it appears that perhaps a small act of reassurance can go a long way. Despite criticism surrounding the merger with Asda, Sainsbury witnessed over a 5-point growth to its reputation over 2018, possibly due to price reduction efforts, pay rate increases or even its heart-warming dedication to employees that went viral across the UK this year. In contrast, it appears Next struggled last year, especially in Q4 with over a 6-point fall. Perhaps this could be attributed to the product recalls toward the end of the year that led many to turn to Twitter to voice their frustrations during the busy holiday season. To make matters worse, the clothing retailer was criticized for a blatant lack of integrity for copying the small fashion designer, Scamp and Dude. Thus, it appears that even in the most trusted industries, actions matter – especially in times of uncertainty. On the other side of the spectrum, we find what many may consider to be ‘necessary evils’ such as the banks and telecom operators. Interestingly, we find that certain industries aren’t doomed from the start with evidence of individual companies successfully differentiating themselves from the industry pack. Most notably, despite investigations and litigations in the beginning of the year, Barclays (+6.0) managed to raise perceptions over the course of 2018 – probably thanks to a strong financial performance and being the first major bank to launch new app features that help its customers stop spending money on the wrong stuff. In contrast, the Royal Bank of Scotland Group – in last place and falling (-4.1) – still suffers from the fallout of the financial crisis where failure to address issues has continued to create an atmosphere of mistrust amongst the public. While RBS has been working hard to come a long way since 2008, it is still embroiled in the PPI scandal, and its own boss recently admitted it would take another 5-10 years before the British public will be willing to forgive and forget. Another major mover this year was BT Group (+5.7) which suffered criticism over broadband investments, the past accounting scandal and job cuts earlier in the year, but perceptions seem to have changed right around the time of the new CEO appointment in October – perhaps this change in management was the right call at just the right time. Swift changes, however, may not always be so well received. Unilever’s proposal to move out of London seems to have stunted affection across the UK, where after the announcement of scrapping the relocation plans perceptions jumped by 6.8 points – making Unilever the biggest riser of 2018. What may be even more interesting is that despite mounting negative news coverage around the restructuring and the retirement of the hero of conscious capitalism, Paul Polman – the consumer goods giant’s reputation never declined. Perhaps the brand’s continuous efforts to bolster reputation and secure integrity allows the public to give a little more benefit of the doubt. In contrast, EasyJet’s profits may have taken off, but the reputation seems to be on a slow descent. Whether people were put off by the 52% pay gap or the numerous cancellations due to strikes over the summer, it appears that brands built on low-price, low-value propositions may not enjoy the same benefit of the doubt as those with a sense of purpose. As we close the chapter on 2018, lessons from the UK suggest that what matters most to stakeholders is not what sector a company belongs to, or what crisis befalls it – but rather what it does and how it handles it.